Bunk beds were loads of fun when we were kids. Either at home or at summer camp, you would wrestle with your mates to see how got the top bunk and you could fly out of your bunk the in morning to take on the world. Well, the good news is you can know get your hands on Best Camping Bunk Bed Cots for your weekend getaways. 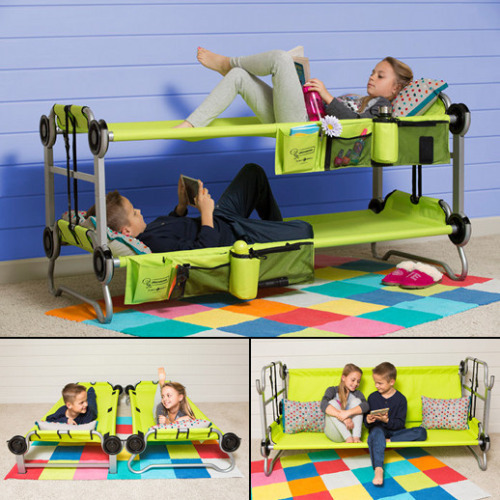 These are not the heavy bunk beds from your summer camp days, these are portable, durable bunk beds made for today’s campers. the Large Disc-O-Bed Cam-O-Bunk Cot with 2 Organizers. For many people going camping is one of the most liberating feelings in the world as it allows them to get away from the hustle and bustle of the city and spend some quiet time communing with nature. These bunk beds solve two problems. First sleeping on the ground and be downright uncomfortable and second, everyone should have a bunk bed. So let’s take a deeper look at three of the best-selling camping cot bunk beds on the market today. After all, what is better than one cot? A bunk bed cot! 2.5 And the Winner is ? This camping bunk bed cot has it all. Not only can you double up, but the fine folks at Disc-O-Bed have added organizers to help you stow your gear within easy reach. Now you might think setting up camping bunk beds would be difficult, but this cot features a patented disc system which allows you to set up the bunk without tools. During our tests we found set up to be breeze and the disc system works well, and the rail system helps to ensure stability. The bunk also works really well it functions in much the same way as your mattress at home. The Disc-O-Bed Cam-O-Bunk with 2 Organizers is extremely durable and each cot has a maximum capacity of 500 lbs. It is also build for adults, the dimensions of the cots are 82” x 40” and when it is assembled the bunk stands at 3 feet with enough room for the person in the bottom bunk to sit up without having to worry about bumping their heads. You will need to contact the seller to confirm the warranty if you purchase this camping cot bunk bed on Amazon. They call this camping bunk bed cot , the large version, but it is actually slightly smaller than the other adult size we reviewed. That being said this cot is durable, stable, and really easy to set up – the patented disc system allows you to set up the bunk without tools. During our tests we found set up to be breeze and the disc system works well, and the rail system helps to ensure stability. The bunk also works really well it functions in much the same way as your mattress at home. The Disc-O-Bed Cam-O-Bunk with 2 Organizers is extremely durable and each cot has a maximum capacity of 500 lbs. It is also build for adults, the dimensions of the cots are 81.75” x 32.25” and when it is assembled the bunk stands at 3 feet with enough room for the person in the bottom bunk to sit up without having to worry about bumping their heads. This is the camping bunk bed cot choice kids. Even though it comes in an iridescent lime green color, it is sturdy, stable, and easy to set up. If your kids want a bunk bed they can take with them, this is the go-to choice. One feature of all Disc-O-Bed camping cots it the no tools set up. Which is great, you don’t want your camp cot to be like setting up your child’s crib. By the way, you can also set up the cots separately – meaning it can be a bunk or two separate cots. The cots come with zippered carry bag which helps when you need to carry it to the campsite or store it back home. They are also waterproof and the sleeping mast is machine washable. Similar to other Disc-O-Bed camp cots, the material will match the shape of your body, so it is just as comfortable as sleeping on a mattress. Let’s face it, someone needs to carry this cot from the car to the campsite. Even though camping cot bunk beds are heavier than standalone cots, you still want it to be easy enough to carry by yourself or some help. The obvious choice Disc-O-Bed Youth Kid-O-Bunk with Organizers as it is nearly 30 lbs. lighter than the adult versions. You are just visiting, so you don’t want to spend a fortune on something you won’t use every day. Whilst all three options are offer good value for money, after all, you are essentially buying two cots, the Disc-O-Bed Youth Kid-O-Bunk with Organizers comes out on top here. This should not be a big surprise as it is smaller than the adult versions. Don’t despair, you cannot go wrong with the adult versions as well. This is actually a toss-up. We tried to destroy all three camping bunk beds, and short of setting them on fire or having at them with a chainsaw, these cots will stand up to anything you through at them. The frames are durable and the sleeping masts are extremely resilient – even after washing. So we have looked at portability, value, and durability. However, deciding which camping bunk bed cot is best really depends on how you plan to use it. For me the best choice is the Large Disc-O-Bed Cam-O-Bunk Cot with 2 Organizers, it is a high-quality cot at a great price and can handle just about anything I would plan to through at it. This one is tough as the kids bunk bed cot come out on top in a number of categories. But let’s face it kids grow up and you will need an adult sized cot. As such, my choice is the Large Disc-O-Bed Cam-O-Bunk Cot with 2 Organizers, not only is it comfortable, but it is also built for adults. This is not to say the Disc-O-Bed Cam-O-Bunk with 2 Organizers or the Disc-O-Bed Youth Kid-O-Bunk with Organizers are not good products, they just weren’t the right choices for me. As you conduct your due diligence, make sure to check customer reviews on Amazon and other websites. All three of the cot bunk beds are highly rated and have great reputations, but the key is to look for other customers who will use the cot the same way you will. Remember to check out the terms. Is shipping included, what is the warranty and who do you call if you have a problem? Let’s face it, we live in the real world, so make you check the fine print first. Lastly, is the cot you want in stock? If not, are you willing to wait until it comes in? Making sure you know when your choice will ship and be delivered to you is important as who wants to keep sleeping on the ground? All of 3 Best Camping Bunk Bed Cots are, portable, durable, comfortable, and will help you get off the cold, hard ground. In the end, the choice is yours, do you need a camping cot bunk bed for your kids or for someone is a little bit taller? 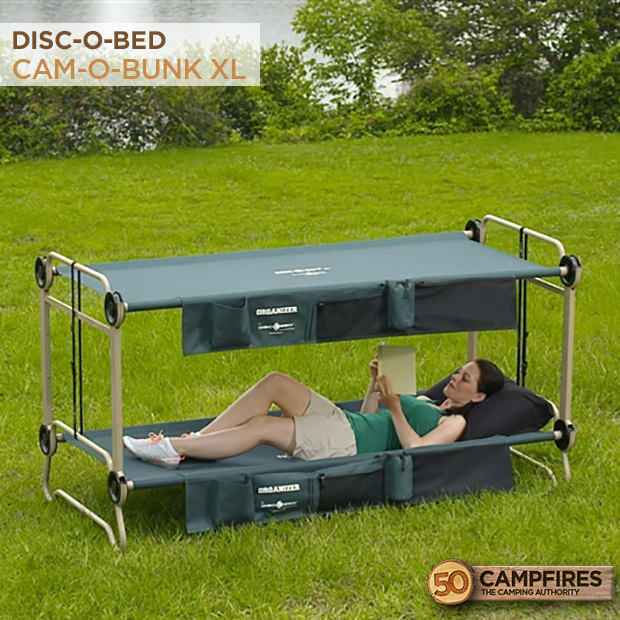 If you are an average height adult and are seeking a good quality camping bunk bed, then go for the Large Disc-O-Bed Cam-O-Bunk Cot with 2 Organizers. You can’t go wrong with any of these camping cot bunk bed , just take a step back and review what you need before you buy. In the end, the most important thing is getting a good night’s sleep. For a family consisting of more than one child like ours, kid’s bunk beds are ideal to accommodate both our kids in a single room. And this thought of mine was further manifested by this excellent blog post by Rock which clearly showcases the different types of bunk beds available for kids and what attributes you should look for when buying one for your little ones. I am looking for a durable cot (folding bed for my kid) with a length of less than 150 cm and width of less than 67 cm. Could anyone help me?